Usually, boxing movies bear little resemblance to the reality of the ring. From Rocky to Raging Bull, they are filled with fake blood and choreographed punches which sound like thunderclaps. But one just released on DVD represents what it is all about and it stars one of Britain’s outstanding world champions, Josh Warrington. OK, so Josh is no Stallone or De Niro but the film of his life from being a qualified dental technician to IBF world featherweight kingpin is one of the most enthralling documentaries ever made about a noble artist. Leeds may be some distance from Hollywood but here is biopic which captures the actual realities of boxing as it is today. Muhammad Ali and of course the Oscar-winning epic about Jake La Motta. 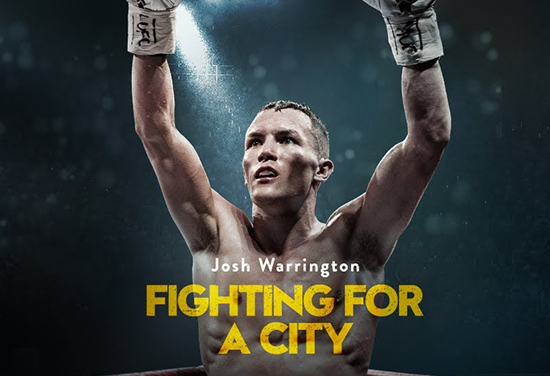 But 28-year-old Warrington is different because he portrays himself in the brilliantly-made documentary called Fighting For A City, which surely will be coming your way on a TV screen soon. Distributed by Universal Pictures, the 92 minutes long movie is about the mutual love-affair between Josh and his legion of devoted Leeds fans in the build-up to his victory over Lee Selby to win the IBF title at his beloved Elland Road, five months back. He comes across exactly as he is; an articulate, cerebral and level-headed young man with an intense love of his sport and his family, while highlighting the dangers and sacrifices boxers face to become world champions. Cameras directed by Jacob Pound and Greg Hardes followed him around for two years filming his long and arduous training sessions as well as his home life as he fought his way towards his epic clash with Selby. Warrington is Leeds’ first world champion and one who doesn’t do bling, bellow like Bellew or cause mayhem like Mayweather. He simply goes about business in an intelligent and methodical manner. He makes no bones about this business being a brutal one. Fights are shown in which the blood is real, some of it his own. It is a fascinating prelude to the first defence of his crown against Belfast’s formidable former world champion Carl Frampton at Manchester Arena on December 22 in what many critics including The Sun’s esteemed Colin Hart, are already hailing as prospectively the fight of the year. Yet away from the ring there is a much gentler side to the rugged all-action man who insists:”I am Leeds through and through. What you see is what you get. I’m just a lad from an estate. My ultimate goal is to put the city on the map.” You might say he already has. tender moments with his new-born baby twin daughters are touching. And here is one dad who is not afraid to change nappies. He talks movingly about holding his wife before he goes to war in the ring. “I always embrace her like I’m holding her for the last time” as he remembers how, before he beat Selby in May, they hugged even more intently. Also, his close relationship with his charismatic dad and trainer Sean O’Hagan, who brought him up as a single parent, comes across vividly. This is a riveting boxing film, beautifully made with drama, for a change, that is unscripted and unrehearsed. Fight fans will love it – and the DVD makes a great Christmas present.